When you signed up to play at Silver Oak Casino, you probably heard that we’ve got 150 casino games. That number keeps changing though. It’s only May 2014, but we’ve already added three brand new games to our lineup. If you haven’t checked them out yet, here’s a brief rundown on what they are and how they work. If you’re looking to put a little ancient Chinese luck on your side, you need to sit down to play Lucky 8, a brand new game at Silver Oak Casino for 2014. Take a trip back in time to ancient China and join the Emperor as he spreads his wealth among the commoners. And believe me, there’s loads of wealth to share in this one. The online slots game comes with two progressive jackpots, plus a very generous win-win feature that means you’ll guaranteed to leave the bonus round with a prize no matter what happens. If you think sharks are scary, don’t worry so much. At Silver Oak Casino, they wear braces (how frightening is that, really?). At least that’s the case in Shark School, a 50-payline, 5-reel slots game with a 4th row – the first of its kind at Silver Oak Casino. 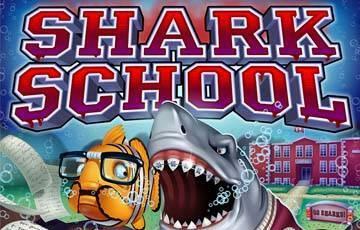 Shark School has a colorful cast of characters who are standing by to hand you big rewards. And I’m not just talking sharks. I’m talking clown-fish wearing glasses and whales with letter jackets. It’s high school all over again, without the anxiety that comes with pop quizzes and exams. This game definitely has bite, especially with a top award of 200x your bet per line waiting to be won in one of three different free bonus rounds. Have you played Naughty or Nice at Silver Oak Casino? I tend to gravitate towards that game every Christmas. And I usually end up playing it for weeks after Christmas, well into the new year. It’s not your typical Christmas game. Sure, it’s got Santa and Mrs. Claus. But the real stars of the game are the Naughty and Nice girls, two very attractive, but not very dressed ladies. Your goal is to get on the Nice list, though when you see what the Nice girl has in store, you won’t care where you end up. Well, the two ladies are back, but this time they’ve escaped the North Pole. And if you thought what they were wearing last time was a bit revealing, wait until you get a load of their attire for Spring Break. Yup, bikinis are where it’s at, and while the wardrobe are skimpier, the rewards are anything but. The 30-payline game has two jackpots, two feature games, and an impressive top payout of 48,000x your bet per line. Definitely worth playing. Lucky 8, Shark School, and Naughty or Nice Spring Break are all available now at Silver Oak Casino. If you don’t have an account, create one now. It’s free to do so and you can test out the games without risking anything at all.